Every Tuesday night, many of us meet at the track for interval workouts. You can meet our club by just showing up. 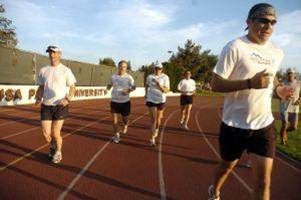 This is a good time for beginners to run with the intermediate and advanced runners to get encouragement and advice. Early Saturday mornings, we meet at Classic Coffee in Glendora for our weekly distance run. You may spot our distance runners up Garcia Trail to Glendora Ridge Motorway. 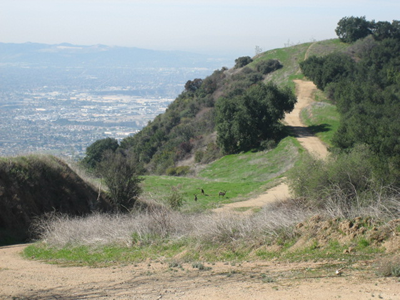 This trail traverses the foothills overlooking Azusa and Glendora. We do a 13 mile loop over to Glendora Mountain Road and then down Colby Trail back to Classic Coffee. If you run far enough up Glendora Mountain Road, the view at the top looking back is spectacular. Copyright © 2012 Glendora Ridge Runners. All Rights Reserved. Powered by Blogger.